The images of suffering and destruction in the wake of Typhoon Yolanda after it hit the Vizayas (central Philippines) are powerful reminders of why we need to learn our lessons from what happened. Lives and properties were lost after one of the strongest typhoons in recorded history wreaked havoc to towns and villages along its path. It was a gruesome experience for most people whose lives are now forever altered by what they have been through. For all the lives that were lost and for all those who barely survived, we owe it to all of them to learn something so that we will come away wiser after Yolanda. We need to be honest and brutally frank about what went wrong and how we should change to get a better outcome if and when faced with similar calamities in the future. Lest we forget these lessons, I believe each of us can put our thoughts into writing to make sure we remember. Every person will have his or her own view and experience with the unfolding of the destruction and everything that occurred afterwards. These are all unique experiences that we can use as a society to discuss the best ways to move forward. 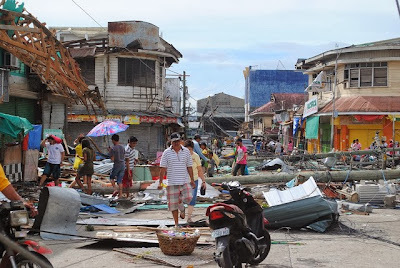 I was not a victim of the calamity nor was I a relative of anyone in the affected areas. But I witnessed what everyone else must have seen, heard or read in the news on a daily basis. And from the observations that I have made, I think there are key lessons that we can all learn from and hopefully never forget. We were not prepared and continue to be unprepared for typhoons despite being one of the most typhoon-prone country in the world. It’s been said over and over that we experience more than twenty typhoons a year. But that apparently has not given us enough leverage to face typhoons better. Sure, this was an incredibly strong one but it’s difficult to understand how we apparently missed the basics. People were not adequately evacuated to safer grounds, there was no quick response plan, the disaster response organizational structure was not well-defined, we didn’t know what storm surges were, etc. The government is structurally inadequate to address the needs of the people. This just validates our third world status as a nation. We don’t have the means at our disposal to provide massive and concerted response to an enormously difficult undertaking which was required in our own country. We didn’t have body bags for the dead, we didn’t have helicopters to reach all the towns and villages affected, we didn’t have mobile hospitals, we didn’t have tents as temporary shelters for the people made homeless. It was a stark reminder that we are still a country which is still lacking in basic necessities and still needs to work doubly hard to get things better. “Zero Casualty” is a goal that is not seriously being pursued. It’s being announced as the intended outcome before every typhoon but we don’t see the corresponding actions required to make it happen. That’s why this goal has never been met and will continue to be unmet. Typhoons can cause tsunami-like “storm surges”. I don’t recall any other previous typhoon which caused such great tidal waves as what has been described by survivors of Yolanda. It’s something we should really study further and learn from so that we’ll get a better handle on how to accurately predict its occurrence and thereby avoid its disastrous outcomes. The media is obsessed with conflicts even in times of calamities. They like calling out politicians for bickering when unity is called for but the media obviously seek these stories out because they know conflicts sell. They like to stir things up which we can easily observe by the way they ask their questions during interviews. They are equally liable in making situations worse and should also take the blame for their misbehavior. The global community stands ready to extend a helping hand. Although we all wished the response was sooner, the world saw what happened and they did not hesitate to help in whatever form they can. This is something we should always remember so that we can do the same when others are in need. Filipinos’ “bayanihan” spirit is still alive. Many pinoys contributed in whatever way they can to help their fellow countrymen. Some gave their time to help in repacking of relief goods, others volunteered to raise funds, some helped by donating money to the organizations providing support to the victims. There were so many different means of extending help and the Filipino people did everything they can think of to contribute. The bayanihan spirit was an extraordinary thing to see in practice and is definitely something we should all be proud of.